Interesting questions and answers for the potential presidential candidate. They are predicting a big snowstorm today (1-26-15). And what happened in the supermarkets in NYC and the eastern part of the US also was predictable. A run on the stores for basic items is a common occurrence when it looks like things we need might become unavailable. Speaking of predictable and unavailable, think about what would happen in a blackout of any length of over a few days and ask yourself why no one is predicting what will happen and planning for it. It's nearly a sure thing to happen to the power grid the way our government and power companies are handling security and infrastructure design. 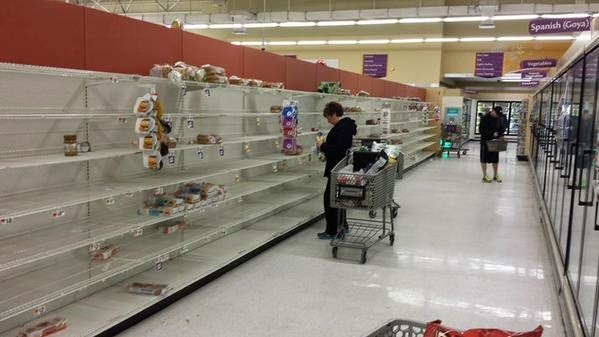 The result will make this snowstorm and the resulting shortages look like flurries. Without the juice, we are back in the 18th century. No lights, heat, or refrigeration. Limited water, no cell phone service, no police to call since you can't reach them when you need them. No credit cards because there are no readers operating. No internet because you can't reach it. You get the idea. Nothing happens without the grid. Without it no one has any funds to buy what they need since all of their wealth is nothing but zeros and ones on computer drives in the "cloud." A cloud that doesn't exist without the juice. This incident is a wake up call for a complacent and arrogant country. The grid can go down for technical reasons as it becomes increasingly overloaded. It's happened before. It can also be brought down intentionally by terrorists using malicious software. Even disgruntled employees in the industry can cause major havoc. It's frightfully vulnerable to an ever increasing list of groups and countries who wish our society ill.
People who don't think it's a big problem should read America the Vulnerable, by Joel Brenner. Then they will have an informed opinion. I'm sure there are other books as well. But you don't hear much about this. It doesn't seem important in light of the other big potential problems we face, like global warming. So I understand why it's not on the radar screen for the citizenry. Priorities don't cha 'ya know. The Institute for Justice is the real american civil liberties organisation. Going to bat for our rights and advocating common sense laws is what they do everyday. If this man was shown on the nightly news being carted off to prison, people would be outraged. Instead, they just yawn and let this stuff go. It seems like such a small thing until you realize the ramifications. PS This is a blog. It's designed for comments from readers. Don't be timid about commenting below.